Fracture body enables real-time persuasive destruction of objects. When collision with some body occurs, a destructible object is procedurally fractured into pieces, which in turn can also be fractured until the desired level of destruction is achieved. Fracture bodies are quite inexpensive type, and can be broken into a moderately large number of pieces. 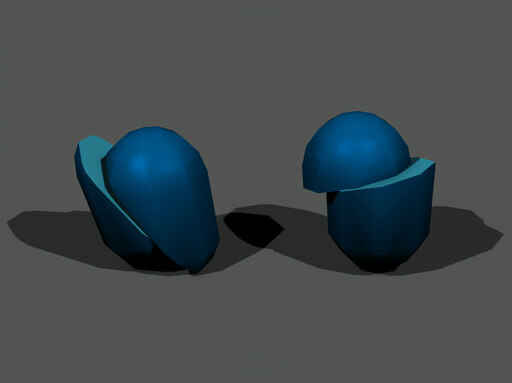 Fracture body can be assigned only to dynamic mesh objects and can be used for only for convex meshes. After the body was fractured, its mass is distributed among the pieces and they tumble down as rigid bodies would do. 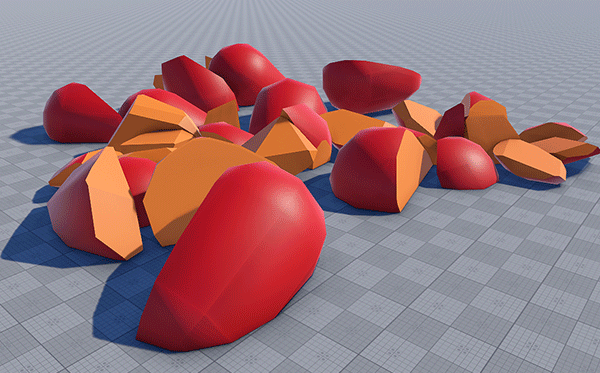 The higher the value, the less vertices there are in the created shape, but the more details are skipped and the shape may not cover the whole mesh volume. The maximum value is 1. An autogenerated shape of a fracture body is not displayed in the Shapes list on the Physics tab of the Parameters window. You can not remove it or assign any other shape to a fracture body. These patterns determine fracture paths that are relevant to different mechanical properties of materials (e.g., its toughness and porosity). Fracture patterns are available for choosing on the script level. Slicing is a fracture pattern separating the mesh volume into two pieces by a plane. The plane passes through a specified point of the body. Slicing angle is determined by a specified normal. To slice a fracture body use the createSlicePieces() method. Cracking is a fracture pattern involving formation of radial cracks from the point of collision. All of the crack pieces slightly vary in size to ensure visual realism. Moreover, the mesh can be additionally fractured along concentric rings, simulating spread of the impulse. The thiner and more brittle the material is (e.g., glass), the more rings tend to be formed by fracturing. The specified distance between the rings is also randomly varied to provide convincing result. To crack a fracture body use the createCrackPieces() method. 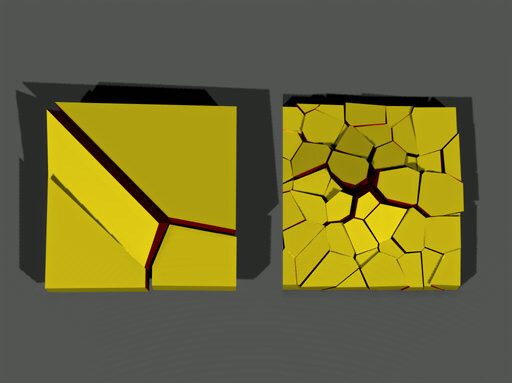 Shattering is a fracture pattern randomly dividing the mesh volume into the specified number of convex chunks. To shatter a fracture body use the createShatterPieces() method. As the body is fractured, especially for several times, small pieces may start to hit the performance. Volume threshold determines the minimum volume for fractured pieces and thus controls the level of fracturing. All chunks that are smaller than the specified value, will not be generated. By the minimum value of 0, all the pieces up to the smallest one created by fracturing are simulated. By higher values, only pieces big enough are generated. If no pieces have sufficient volume, the body stays unbroken. After the body has been fractured, it acquires a Broken flag. Unsetting this flag puts the fractured mesh back into unbroken state. The broken body remains represented as one node in the UnigineEditor hierarchy. 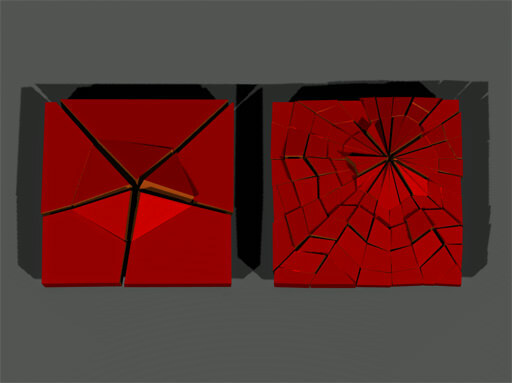 Generated fractured pieces are automatically represented as Fracture bodies and they inherit physical parameters of the fractured body (such as damping of linear and angular velocities, friction, restitution and masks). Fractured pieces cannot be manipulated using the UnigineEditor! When fracturing a mesh, it is necessary to set the material that will be applied to all newly created fracture surfaces. Those faces of fracture pieces that were external, keep the initial material. A new property for all fracture surfaces can also be assigned. They define game behavior and additional physical properties, however, body parameters override them. Use volume threshold parameter to reduce the number of fracture pieces. Remove the pieces of a fractured body from the scene. A code-based example, illustrating how to remove (fade with the time) the fracture pieces from the scene can be found here. Select dynamic mesh object to assign a fracture body to. Go to the Physics tab in the Parameters window and assign a physical body to the selected object by selecting Body -> Fracture.